When news of J.D. Salinger’s death was reported late Wednesday afternoon, I was surprised, but then not. Despite being one of the most recognized American authors of the twentieth century, Salinger was also one of the most reclusive. 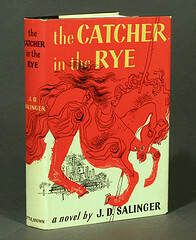 After being thrown into the limelight in 1951 with Catcher in the Rye, Salinger moved to a 90 acre home in Cornish, New Hampshire and, after an unwelcomed newspaper article was published about him by a group of high school students he had befriended, he erected a 6 ½ foot tall fence around the perimeter in order to keep people out. Even though few of us knew anything about his failing health or major accidents, Salinger was 91 years old, and 91 is a ripe old age. Salinger’s most recognized work, Catcher in the Rye, faced issues in translation that still haven’t been resolved today, some fifty-nine years later. According to Bernd Wahlbrinck, an English teacher and Salinger enthusiast living in Germany, the novel was harder to translate into certain languages than others. …weird tendency to translate the past tense into German Praeteritum, which is, however, usually stupid because in colloquial language we just don’t use it most of the time. Thus, in the very first sentence of the novel, it says ‘… was meine Eltern taten…’. Actually, nobody says that, certainly not a kid of 17; we would say something like ‘was meine Eltern (so) gemacht haben’. Se querem mesmo ouvir o que aconteceu, a primeira coisa que vão querer saber é onde eu nasci, como passei a porcaria da minha infância, o que meus pais faziam antes que eu nascesse, e toda essa lenga-lenga tipo David Copperfield, mas, para dizer a verdade, não estou com vontade de falar sobre isso. The website is definitely a good read for anyone interested in translation and Catcher in the Rye, and I’m interested in hearing from translators if you all agree with Wahlbrinck’s assessment of the issues surrounding the novel’s translation.